fficiency and rate of gain and is designed to feed a greater percentage of different sized fish in your pond. erent-sized fish in your pond helping smaller fish grow. 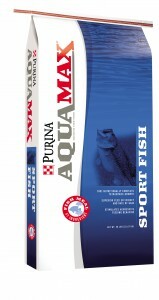 Stop in at Argyle Feed & Hardware today to try out Purina AquaMax Sport MVP for your pond or lake stock. Our product experts will answer any questions you have about managing your pond or lake to provide a thriving environment for your fish. We carry a variety of pond management supplies including algae controllers, supplements, pumps, and fountains, too. Visit us today! This entry was posted on Wednesday, April 6th, 2016 at 4:52 pm	and is filed under News & Updates, Wildlife, Deer. You can follow any responses to this entry through the RSS 2.0 feed. Both comments and pings are currently closed.